Remember how I said I used to be in that medieval group? Every once in a while someone comes looking for me on Facebook and yesterday it was one of my ladies-in-waiting. 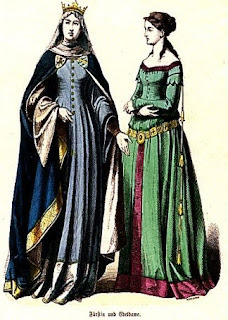 Let me tell you, it is great to get a message saying, "It's Elizabeth, your lady-in-waiting!" That is good for a person! That is a picture up above of me and Elizabeth, my lady-in-waiting, back in the day. I am on the left and she is on the right. I smiled happily as I confirmed the friendship because every once in a while I forget that I am royalty. That same day I got a package from California and it was from Leonard Pennario's brother. He sent me a CD of Pennario playing the piano concerto by Miklos Rozsa with the Milwaukee Symphony and that was something beautiful that made my day. "This is a little surprise for you," he wrote. "I'll tell you about it the next time we talk." That was the joke and I loved it. It sounds like something I would write. Perhaps I will call him. On second thought maybe I will have my lady-in-waiting do it. I was just thinking, the other day, how Jhryn and I were going to sing The Beatles' "Her Majesty" to you at your coronation. As you'll recall, the repercussions of his infidelity put the kabosh on that. I would like to quote John Field, a great pianist of the past. He declined a court pianist title with the following: "The court is not for me and I do not know how to pay court to it." And Prof., what an elegant quote from John Field. You get such an image of the man.